IEC/TR 60930:2008(E) is intended to lessen the risk to patients, operators, and their surroundings by providing a code of safe application. This reduction of risk is in addition to that brought about by the risk control measures incorporated in the medical electrical equipment, the medical electrical system, and the electrical installation in medical locations, hereafter referred to as me equipment, me system and installation respectively. 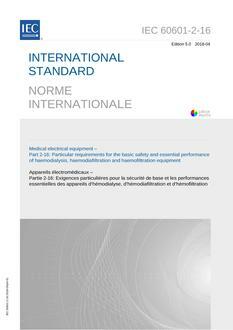 Not all existing me equipment, me systems or installations meet the requirements of the relevant IEC standards. From time to time, operators and responsible organizations will encounter me equipment and me systems complying with older safety standards. However, the guidelines for safe application given in this technical report should nevertheless be followed in so far as this is possible. The guidelines in this technical report can be used with me equipment or me systems for the home healthcare environment provided the manufacturer has included home use in the intended use or the clinical engineering department has checked that the electrical installation and the physical environment will not result in any unacceptable risks. These guidelines can also be applied to equipment used for compensation or alleviation of disease, injury or disability. 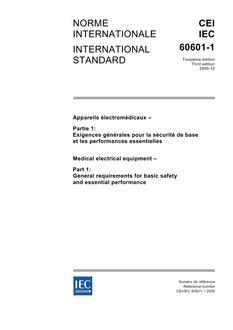 If the me equipment, an me system or the installation does not comply with the relevant IEC standards, the responsible organization should consult with the clinical engineering department or the manufacturer for instructions on how to achieve an adequate level of safety. This second edition cancels and replaces the first edition published in 1988. This edition constitutes a technical revision. This edition has been aligned with IEC 60601-1:2005, IEC 60601-1-2:2007, IEC 60601-1-8:2006 and IEC 62353:2007. 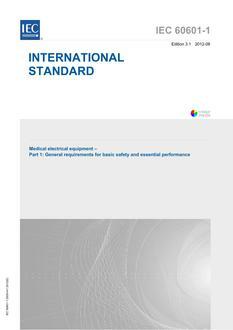 This edition includes medical electrical systems within its scope.